When I was about 12 I was tuning the TV for other stations and discovered my first TV DX station, well Iowa anyway. This was my first band opening. Lucky for me, my Grandpa knew about radio and he encouraged me to learn about it, with an old Johnson CB that I put on the air as KTQ8376. 1973. I went on to be a die hard SWL and scanner enthusiast. I put up a 5/8 wave CB vertical where I learned that 11 meter openings meant I could talk all over the US. Then life, computers and BBS dial up/primitive early internet sidetracked me. In 1995 I met a local ham, Bill Wood KE9XQ. I asked him how to get a ham radio license and he told me a Technician exam was a month away. I took and passed the Technician exam and received my previous call KB9KTD now WV9E. I bought a RS-HTX-202 as my first radio, I am still using it as an APRS rig and my APRS station has been on the air for 10 years 24-7 straight with the same radio and TNC, a MFJ-1270C. Then a couple years later bought a FT-847 for the satellite ability. I made scores of Sat. QSO's with a vertical for 2 and 70. 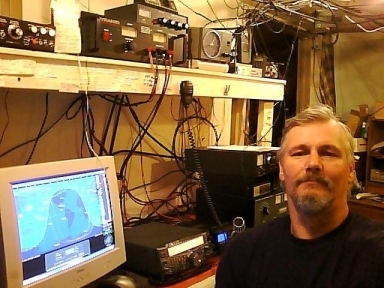 (circa 1999) In 2007 when the Tech license allowed limited HF privileges I got hooked. Then in 2008 I upgraded to General and in 2009 I again upgraded to Extra. I like SSB and digital modes best. My current equipment is a Kenwood TS-2000X with a MC-60 mic a Yaesu FT-897 an Ameritron 811 amp some good VHF+ yagis & Mirage amplifiers a full size 160 meter loop and an 80 meter dipole in the trees. My antennas include home brew verticals for 17,15,12 and 10 meters and I Just bought a KT-34XA beam . One of my favorites radios is my Kenwood TH-D7 dual band HT w/TNC and GPS input. I am self employed (slang for might not get fired) and I try to get on the air everyday. I hope to work you on the waves soon.